Aren’t they just so adorable?!!!! My favourite’s the little penguin! This super cute, quickie project satisfied my urge somewhat to get some crafting in despite the craziness that came at the end of October. My schedule is clearing so I’ll be back to “real” crafting soon. what!!!!! One week before Christmas.!!!! You’re slaying me friend! I could NEVER wait that long. I’m taking my tree out this week! Woooo Nellie … you’re giving me palpitations thinking about celebrating from 1 week before Christmas. LOLOL! These stitchmarkers are so, so cute!!!! I’ve been playing Christmas music in the house ever since November rolled around. My family has gotten used to this quirk of mine and so this year their groans have been fewer, LOL! I love looking at them. 😀 Time for me to start using them! 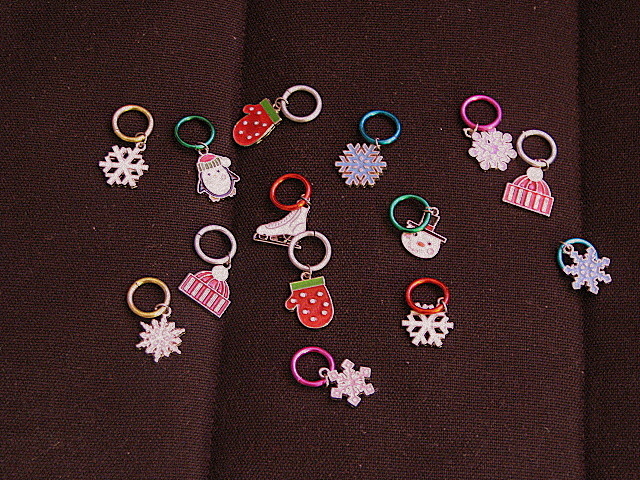 Your stitch markers are just too cute and they will make your knitting so seasonal! We have a cold front that is suppose to arrive on Wednesday and I have chili and cornbread on the menu, I can’t wait! Enjoy yours.